A campaign has been launched in Zimbabwe calling for telecom providers to reduce how much they charge for internet services, reports Zim Techreview. 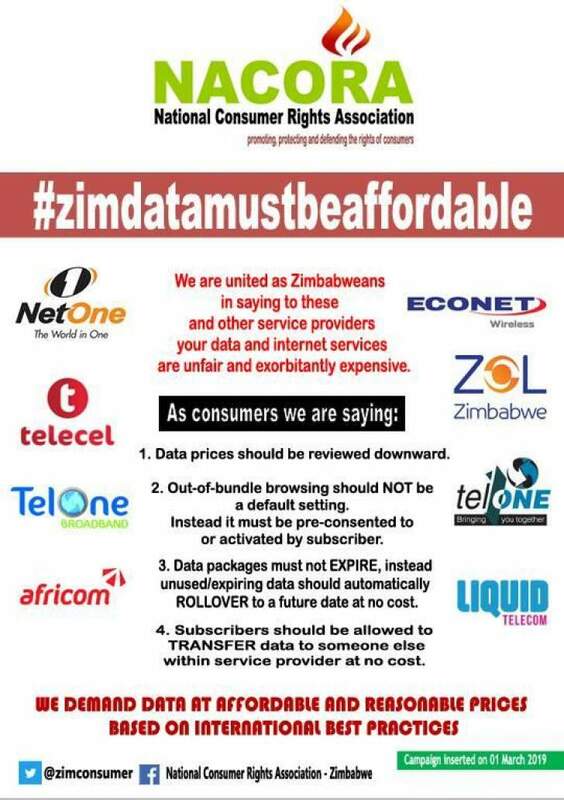 Following in the prints of South Africa's #DataMustFall the National Consumer Rights Association of Zimbabwe (NACORA) has intensified a campaign for data prices to come down. On average a 1-gigabyte data bundle costs more than household necessities such as bread and milk. The hope is that it will be made more affordable across the board and to prevent purchased packages and airtime from expiring after a 30 day period, which is infuriating! Around three in 10 people in Africa have access to the internet. The continent lags behind average global internet penetration, which is just under 50%. NACORA has vowed to take the fight against high cellphone and data costs to their corporate offices in a bid to force them to re-consider their high data costs. 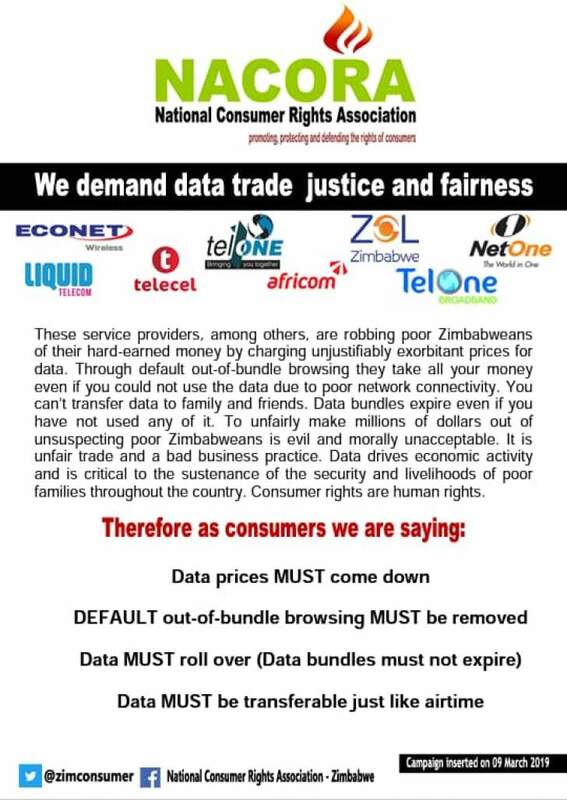 It says that service providers are robbing poor Zimbabweans of their hard-earned money by charging unjustifiably exorbitant prices for data. Through default out-of-bundle browsing they take all your money even if you could not use the data due to poor network connectivity. You can't transfer data to family and friends. Data bundles expire even if you have not used any of it. To unfairly make millions of dollars out of unsuspecting poor Zimbabweans is evil and morally unacceptable. It is unfair trade and a bad business practice. Data drives economic activity and is critical to the sustenance of the security and livelihoods of poor families throughout the country. Consumer rights are human rights. According to a report by broadband market analyst firm Cable.co.uk, which analysed data from 6 313 mobile data plans in 230 countries between 23 October and 28 November 2018, Zimbabwe is the most expensive country in which to buy mobile data. According to the firm, in Zimbabwe, the average cost of 1GB of mobile data during the period was $75.20, which is 289 times the average cost in India, which is the cheapest country in which to buy mobile data, with an average cost of 1GB at $0.26. 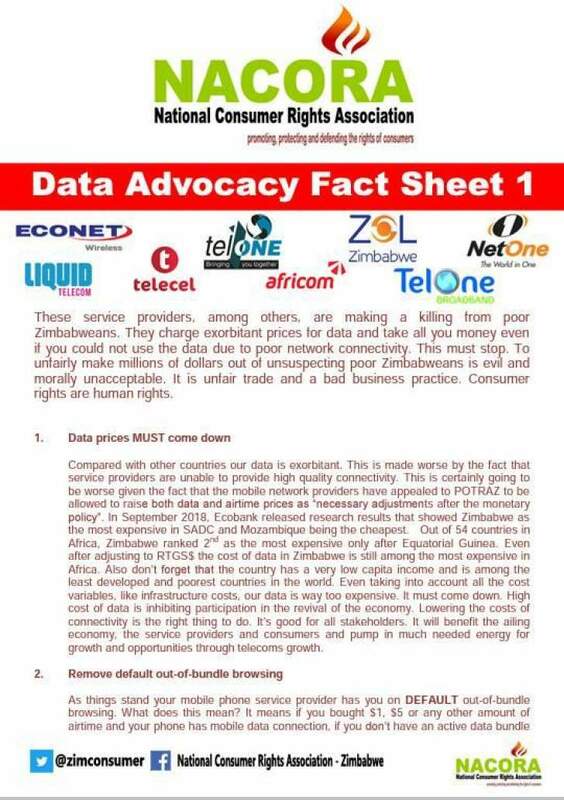 These service providers, among others, are making a killing from poor Zimbabweans. They charge exorbitant prices for data and take all you money even if you could not use the data due to poor network connectivity. This must stop. To unfairly make millions of dollars out of unsuspecting poor Zimbabweans is evil and morally unacceptable. It is unfair trade and a bad business practice. Consumer rights are human rights. Compared with other countries our data is exorbitant. This is made worse by the fact that service providers are unable to provide high quality connectivity. This is certainty going to be worse given the fact that the mobile network providers have appealed to POTRAZ to be allowed to raise both data and airtime prices as 'necessary adjustments after the monetary policy'. In September 2018, Ecobank released research results that showed Zimbabwe as the most expensive in SADC and Mozambique being the cheapest. Out of 54 countries in Africa, Zimbabwe ranked 2nd as the most expensive only after Equatorial Guinea. Even after adjusting to RTGSS the cost of data in Zimbabwe is still among the most expensive in Africa. Also don't forget that the country has a very low capita income and is among the least developed and poorest countries in the world. Even taking into account all the cost variables, like infrastructure costs, our data is way too expensive. It must come down. High cost of data is inhibiting participation in the revival of the economy. Lowering the costs of connectivity is the right thing to do. It's good for all stakeholders. It will benefit the ailing economy. the service providers and consumers and pump in much needed energy for growth and opportunities through telecoms growth. As things stand your mobile phone service provider has you on DEFAULT out-of-bundle browsing. What does this mean? It means if you bought $1, $5 or any other amount of airtime and your phone has mobile data connection, if you don't have an active data bundle or as soon as your data bundle is finished your phone AUTOMATICALLY uses your airtime without your permission even if you are not on the internet. Background applications will be using your airtime to update themselves and the like. Before you know it your airtime is finished, all taken by the service provider. You don't have to activate out-of-bundle browsing, it requires you to deactivate it, otherwise it remains active and using your airtime without your permission. We are saying this is wrong and unfair to consumers. Compared with in-bundle-browsing, out-of-bundle browsing is extremely expensive and therefore should not be a DEFAULT setting. Out-of-bundle rates are many times more expensive than in-bundle-browsing and can therefore wipe out your airtime in no time. No out-of-bundle browsing should take place unless it is activated by the customers. As a customer I must be the one who asks the service provider for out-of-bundle browsing whenever I choose to. This way the subscriber's hard-earned money is protected. Data roll over is about fairness. As things stand if you buy a $100 bundle valid for only 24 hours or $3000 monthly pre-paid data bundle and you fail to use all of it due to time constraints, low consumption or even because the network provider failed to provide quality network for you to do your internet, at the end of 24 hours or month, as the case may be, all of your remaining data expires. Just like that the service provider steals your hard-earned $100 or $3000. This applies both to those on contract and pre-paid mobile and non-mobile data Whatever remains of unused data is stolen from the subscriber by the service provider. We are saying no. this is unfair. Data bundles must not expire. be they 24-hour, 1 week, 2 weeks, 1 month or whatever. If for whatever reason you fail to use all or part of the data bundle, whatever remains of it must automatically roll over free of charge for use in future. This means the remaining data must be moved to the next day or month after the expiry date giving the subscriber another chance to use unused data without extra cost. This is obviously fair to both sides. In any event, the service provider should have an option to opt out of a data roll-over by paying the subscriber back their money for unused data, if the service provider so prefers. Data roll over is now an international practice and our service providers cannot excuse themselves out of iL Millions of dollars are lost by poor consumers on data they never get to use. Time to end the injustice. As things stand you can transfer your airtime to any other person within mobile network without charge, but not so with data bundles. 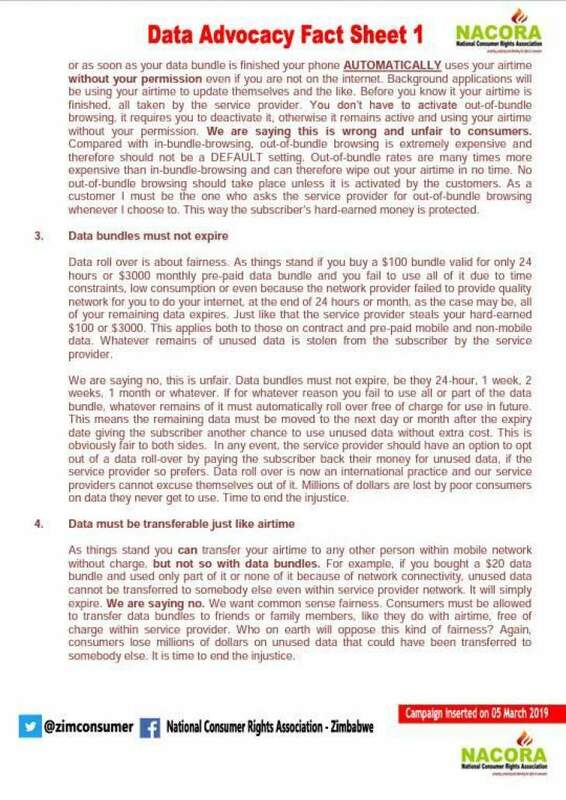 For example, if you bought a $20 data bundle and used only part of it or none of it because of network connectivity, unused data cannot be transferred to somebody else even within service provider network_ It will simply expire. We are saying no. We want common sense fairness. 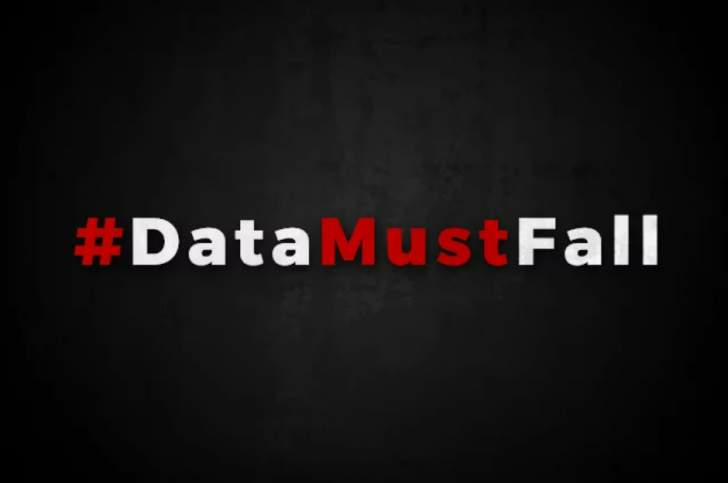 Consumers must be allowed to transfer data bundles to friends or family members. like they do with airtime, free of charge within service provider. Who on earth will oppose this kind of fairness? Again, consumers lose millions of dollars on unused data that could have been transferred to somebody else. It is time to end the injustice.